On the heels of the release of the T+2 Industry Steering Committee white paper outlining the timeline and actions required to move to a two-day settlement cycle (T+2) in the U.S., financial industry executives will convene on September 17, 2015, in New York to discuss the impact of this initiative on the industry. During panels at the T+2 Symposium, operations, technology, legal and compliance, risk and corporate actions professionals will cover the industry’s next steps related to the planning, testing and implementation of the move to T+2. The Symposium will also address how firms are preparing for the transition, the regulatory changes involved and the impact of those changes. Daniel Thieke, DTCC Managing Director and General Manager, Asset and Settlement Services, will be a panelist on “The Road Ahead – Industry Level Considerations.” The session, moderated by Thomas Price, SIFMA Managing Director, Operations, Technology & BCP, will discuss next steps as the industry readies and plans for the material changes that will result shortening the settlement cycle. Joining Thieke on the panel will be Michael Alexander, President, Wealth & Capital Markets Solutions, Broadridge Financial Solutions, Inc., Graeme McEvoy, Global Head of Institutional Operations, Morgan Stanley & Co LLC and Lou Rosato, Director, Trading Operations, BlackRock. During the “Getting There: Firm-Level Impacts” session, John Abel, DTCC Vice President, Product Management, and fellow panelists will explore how individual firms are preparing for the comprehensive and coordinated efforts needed to achieve T+2. Joining Abel on the panel will be Mark Katzelnick, Chief Operations Officer, Fidelity Investments and Frank Tota, Managing Director, Global Operations, Goldman Sachs. 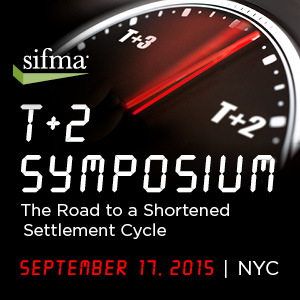 The Symposium run from 8AM to 1:30PM at the SIFMA Conference Center, New York City. Press release: Financial Services Industry Announces Proposed Timeline for T+2 Settlement Cycle in the U.S.